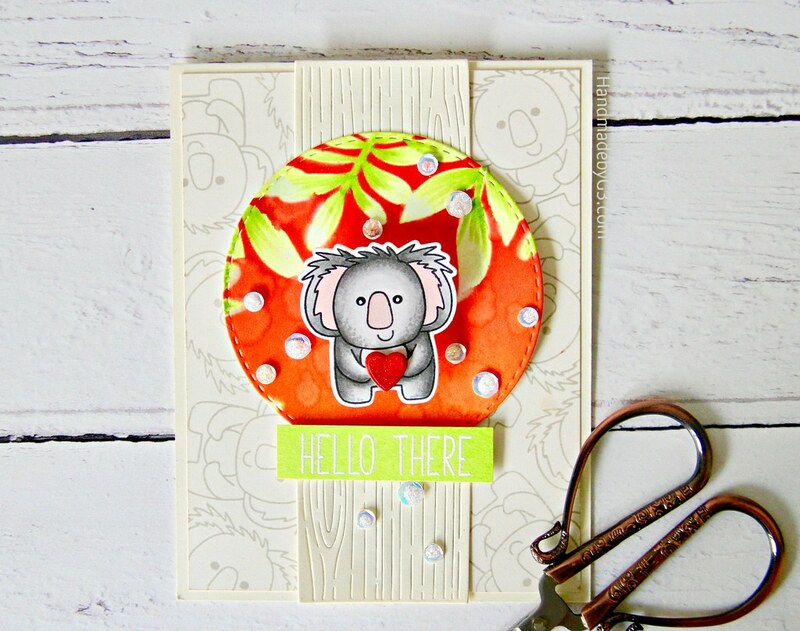 I have a wobbler card to share with you today. I have used Simon Says Stamp stamp set, stencil and dies to make this card. 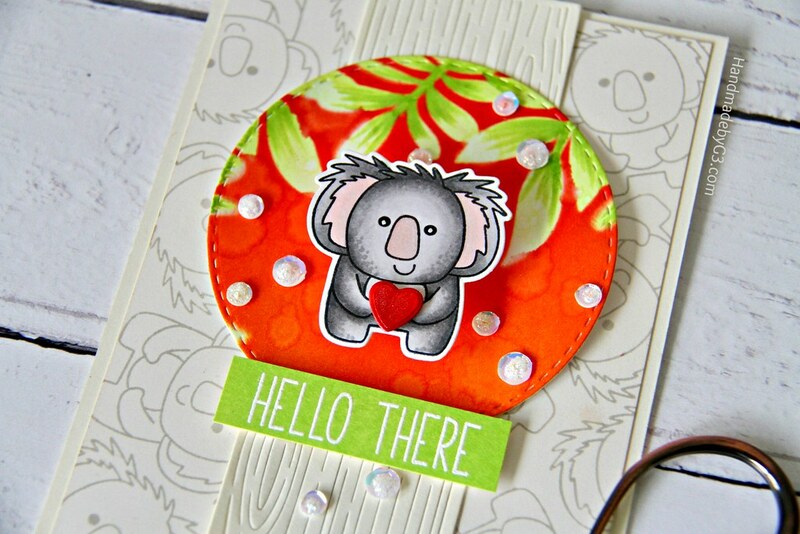 I have meaning to use the Koala image form Hello There stamp set for a long time. Finally, I managed stamp and colour that cutie. Then I die cut the image out using coordinating die. 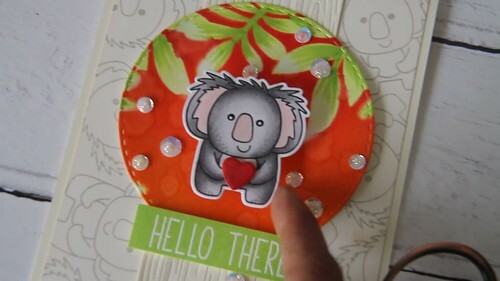 I also die cut a small heart shape from the coordinating Hello There die and adhered to the Koala hands. For the background I used the Leafy Frame stencil to sponge distress inks. I first inked Twisted Citron distress ink on a white card panel. Then placed the Leafy Frame stencil and sponged Candied Apple and Ripe Persimmon distress inks. Then die cut the panel using one of Simon Stitched circle die. I spattered some clear water to add texture on the circle die cut and also added details to the leaves using copic markers. 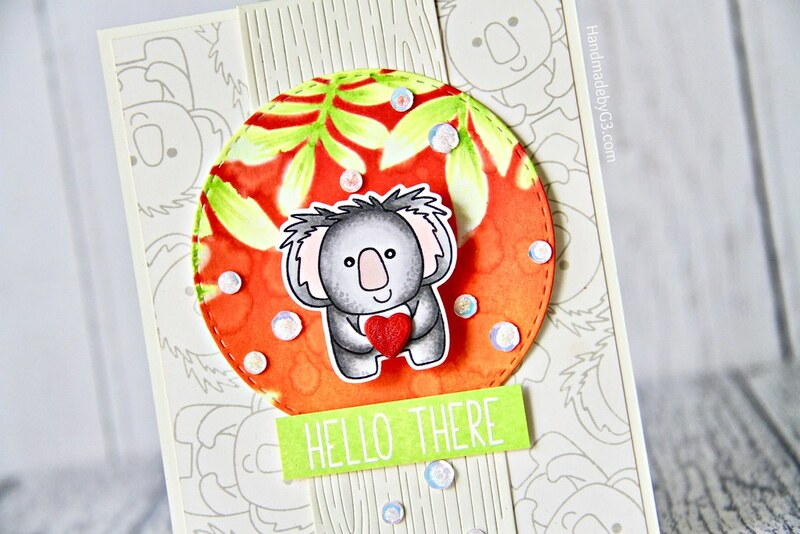 I adhered the koala on the circle die cut using a wobbler. I love the interactive element on a card. This one is so cute. I cannot stop tickling the koala.Lol! 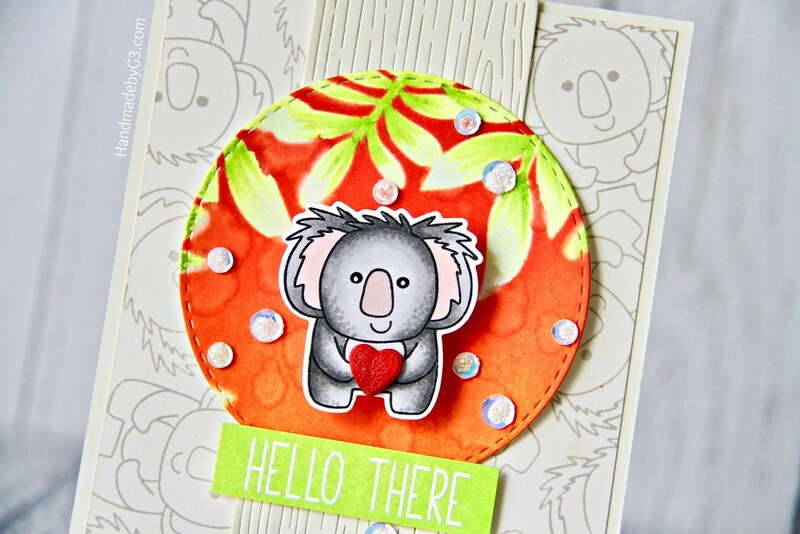 For the background on the card front, I stamped the same koala image using Simon’s Stone ink repeatedly to fill the entire panel. I trimmed the panel to 4’x5.25′. By the way, I am used cream cardstock here. I also die cut the same cream cardstock using Simon’s Woodgrain Block die. I adhered this woodgrain die cut on the centre of the stamped panel. The whole panel is adhered on a cream card base. Then I adhered the circle die cut with the koala on the wobbler on the top of the woodgrain die cut. The sentiment is also from Hello There stamp set which I white heat embossed on a strip of cream cardstock and sponged with Twisted Citron distress ink, trimmed and adhered using foam adhesives. Finally I added some clear sequins filled with sliver Stickles. All supplies used to make this card are below. Hope you enjoyed the card today. Many thanks for visiting. Have a lovely day!